During the first half of the 1800s, Michigan observed an intense debate over the location of the first state prison. Choosing between several cities throughout the state, Jackson was eventually agreed upon as the site of the Michigan State Prison. Starting as a log structure housing only 35 inmates in 1839, this institution would later grow to be the largest walled prison in the world (1). Since wooden military forts were considered by many to be the epitome of protection at the time, it seemed natural to the builders of the prison that this would be a sufficient structure to house prisoners. From the very beginning, however, the prison was known for its vulnerability to corruption and venality. In 1840, only a year after its opening, 10 inmates plotted and executed an escape from Jackson. Because of the prison’s wooden structure, the escape was quite easy for the inmates. These men became known as the Jackson Robber Gang. They made their way through southeast Michigan committing various murders and robberies (2). Despite including only ten men, the Robber Gang was the first organized gang to emerge from the Michigan prison system, marking the beginning of a long legacy of organized prison crime and gang formation. Particularly influential in this gang was an inmate by the name of George Norton. Norton, only 22 years old, was admitted to the prison on April 10th of 1840. Sentenced to 10 years for burglary and larceny, Norton facilitated the planning of the Robber Gang’s escape. After only two months inside Jackson’s prison walls, he led the prison break that would mark the start of the gang’s reign of terror over the state. Coming to be known as “Notorious Norton”, he and his nine cohorts robbed banks, coaches, and homes, as well as stealing livestock and going out of their way to scare well-to-do women. Despite these publicized crimes, neither law enforcement nor civilians were able to catch the gang, most likely because of the intimidation factor of going head to head with a group of notorious criminals. Eventually, a dramatic and deadly face-off between the gang and local farmer, Joseph Videto, resulted in the death of George Norton, and the capture of seven other members of the gang. Only two of the original ten escapees were successful in avoiding recapture. The destruction and fear inspired by the Jackson Robber Gang shook the region, resulting in a demand for greater prison security. It was only after the gang was apprehended that the Michigan State Prison decided to make a change from the original wooden fort-like structure to the typical brick and mortar stone walls we see in prisons today (3). The move to a more secure prison structure illustrates just how influential the Jackson Robber Gang was over the prison environment. This theme of gang influence would only become more prominent at Jackson Prison as time went on. One of the most influential gangs in Jackson prison was the notorious Purple Gang. In May of 1918, the state of Michigan enacted prohibition laws that banned the selling, manufacturing, transportation, and consumption of alcohol. As a result, crime rates, gang activity, and Jackson prison population all drastically increased. The Purple Gang was formed and controlled by the four Burnstein brothers; Abraham, Joseph, Raymond, and Isadore. Many Purple Gang members were recently immigrated Jews from Eastern Europe. The gang, which originally was a loose confederation of independent criminals, began by hijacking alcohol smuggled by others across the Canadian border during prohibition. 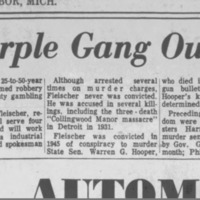 It has been theorized that the Purple Gang’s colorful name evolved during this period, when two Hastings Street [Detroit, MI] shopkeepers referred to these delinquents as being “off color” or “purple.” (4). Al Capone, the famous Chicago gangster, chose to use the Purple Gang to supply him whisky rather than battle them for Detroit territory (5). The Purple Gang had reached the height of its power by 1930 and appeared to be unstoppable. 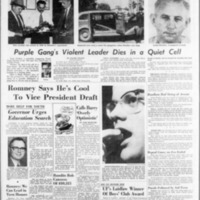 Witnesses to crimes were scared to testify against anyone rumored to be a Purple Gangster for fear of retribution and as a result, The Purples were responsible for approximately 500 murders— many of which went unsolved. Two key members of the Purple Gang, Harry and Phil Keywell, were a few Purples to actually be convicted and placed in Jackson Prison. However, Purple Gang activities did not stop with incarceration. The Keywells simply ruled and ran Jackson prison with their racketeering tactics. 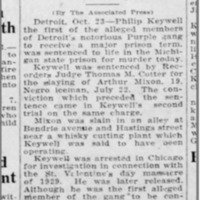 While in Jackson, the Keywell brothers and other Purples brought bootlegged liquor, drugs, and women into the prison (6). Purple Gang Members were also allowed to leave Jackson on the weekend and oftentimes, prison guards gave them regular clothes to wear while they were visiting speakeasies, brothels, sporting events, etc. The Purple Gang was a powerful force inside of Jackson Prison and was known to be very influential in persuading guards and wardens. One example of the Purple Gang’s reign inside of Jackson was their influence on Hank Greenberg. Greenberg was an MLB Hall of Famer and former Detroit Tiger. Abe, one of the notorious Burnstein brothers, was known to be quite close to Greenberg. In July of 1941, per his FBI records, Burnstein called Greenberg and told him to bring his army regiment (training in Battle Creek at Fort Custer at the time)to Jackson Prison for a baseball game. Greenberg’s team was supposed to play against the Jackson correctional institute’s own team that Ray Burnstein played on and managed (7). Abe was not only able to successfully convince Greenberg and his regiment to travel to Jackson for the baseball game, but was also able to persuade Greenberg to play for Jackson’s team. Both the Robber Gang and the Purple Gang played key roles in the history of Jackson Prison. Both gangs were influential inside and outside of Jackson. Because of the Robber Gang, Jackson was rebuilt from the ground-up and transformed into a more secure institution. The Purple Gang essentially ran Jackson from the inside and did not have to live by any of the rules that other inmates had to follow. Both of these gangs are an important part of Jackson’s history and show some of the weaknesses and corruption of the prison. 1. Judy Gail Krasnow, Jacktown: History and Hard Times at Michigan’s First State Prison (Charleston, SC: History Press, 2017). 2. Stateside Staff, “Touring Michigan’s oldest prison with a historian who lives there,” Michigan Radio, August 18, 2017, accessed November 01, 2018, http://www.michiganradio.org/. 3. Judy Gail Krasnow, Jacktown: History and Hard Times at Michigan’s First State Prison(Charleston, SC: History Press, 2017). 4. Kavieff, Paul R.. Detroit's Infamous Purple Gang (Images of America (Arcadia Publishing)) (Kindle Locations 43-44). Arcadia Publishing. Kindle Edition. 6. Judy Gail Krasnow, Jacktown: History and Hard Times at Michigan’s First State Prison(Charleston, SC: History Press, 2017). 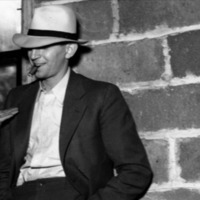 Purple Gangster, Louis Fleisher, is pictured here after his 1936 arrest in Albion. He was a suspect in an outbreak of local business safe robberies. 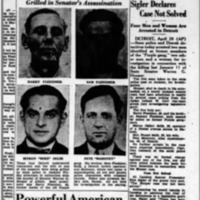 In 1945, members of the Purple Gang were indicted for conspiring to murder state Senator Hooper. Their involvement in this case serves as an example of the Purple Gang being a major player in regional crime, proving the expansiveness of their influence outside of the prison. 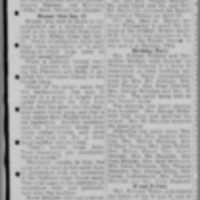 This newspaper article describes the relationship between Al Capone and the Purple Gang. Al Capone was affiliated with the Purple Gang and bought liquor from them during prohibition. 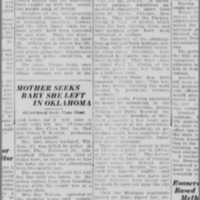 A 1935 Escabana Daily Press article describes the declining influence of the Purple Gang. The fall of the Purple Gang occured in the mid 1930's due to excessive violence and internal conflict. 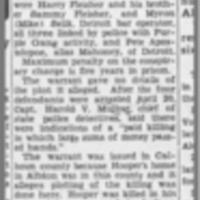 Article from the Detroit Free Press about the death of Louis Fletcher, a prominent Purple Gang member. 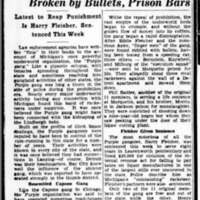 Prison gangs from Jackson, most notably the Purple Gang, often made headlines in local news. This media spotlight illuminates the magnitude of the public interest in, and notoriety of, the Purple Gang. The media attention that the Purple Gang recieved proves that people around the state were aware of the gang activity and corruption surrounding Jackson Prison. These are but a few excerpts from local print media focusing on the gang's activity around the state.